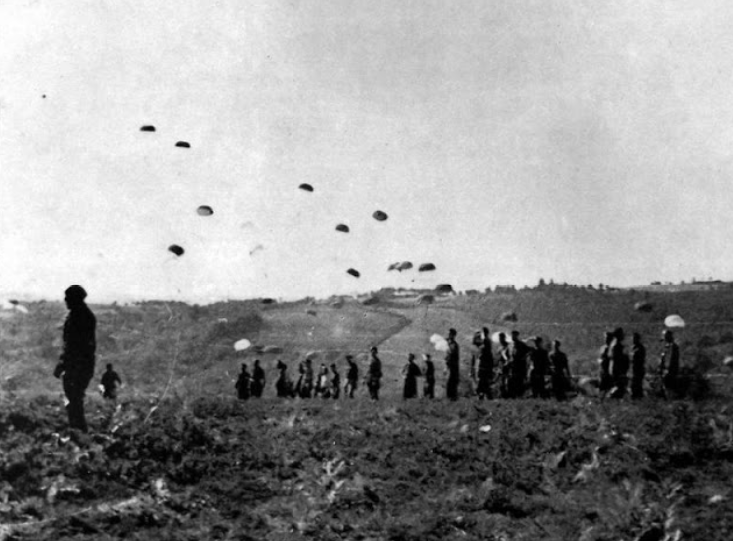 Throughout 1943 and up to June 1944 parachute drops to the Resistance in France had been organised as night time drops and generally around the period of a full moon and to small groups of resistants. This was to maximise the success of each drop but was limited to how many containers could be dropped at any one time, at most 15 to 20. 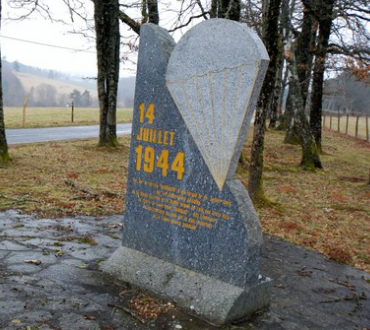 After the mobilisation of the FFI (Forces Françaises de l'Interieur) on the 6th June 1944 the quantity of arms needed by the Resistance meant night time small drops would no longer be sufficient. 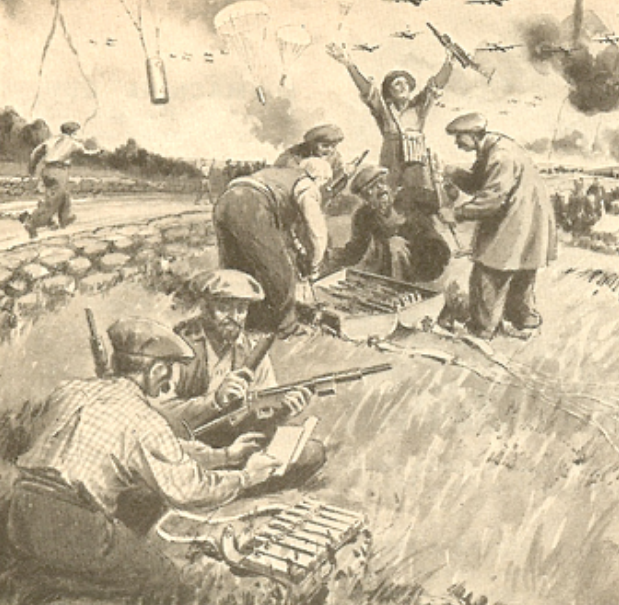 Henri Ziegler, Chief of staff of the FFI, felt that daytime larger drops were needed to be able to supply enough arms and ammunition to an ever growing Resistance. 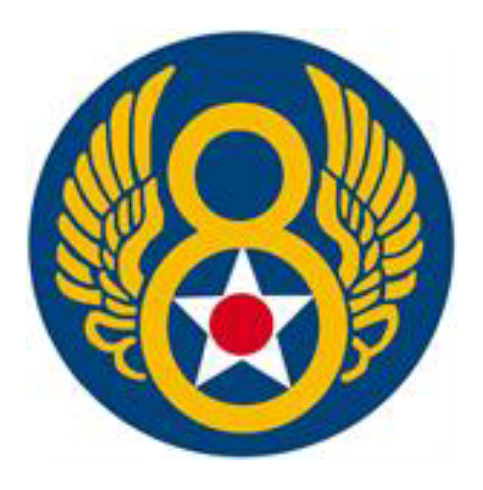 Ziegler discussed the idea with SHAEF (Supreme Headquarters Allied Expeditionary Force) who then in turn contacted the 8th U.S. Air Force (USAAF) based in the South of England who thought the plan to drop 1000's of containers by parachute in daylight viable. 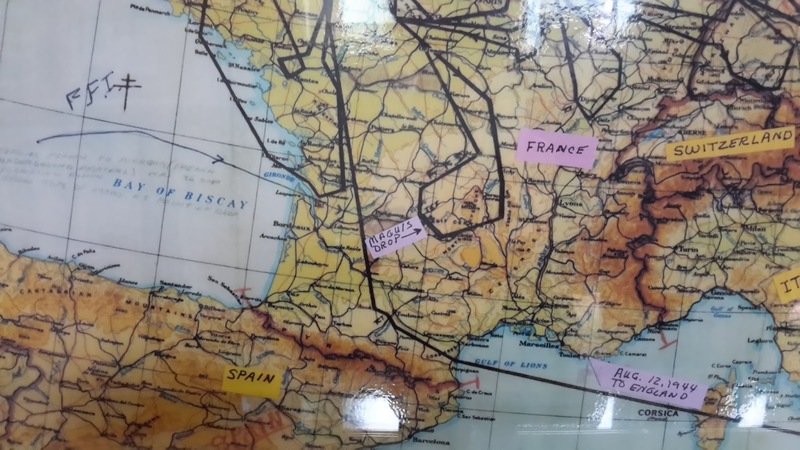 Around the 10th June SOE (Special Operations Executive) agents and Resistance groups in five areas of France were contacted and asked to confirm if land was suitable for such a drop and enough people would be available to secure the area and collect and transport away the containers. The first daytime mass drop was organised for 25th June 1944 codenamed Operation Zebra. 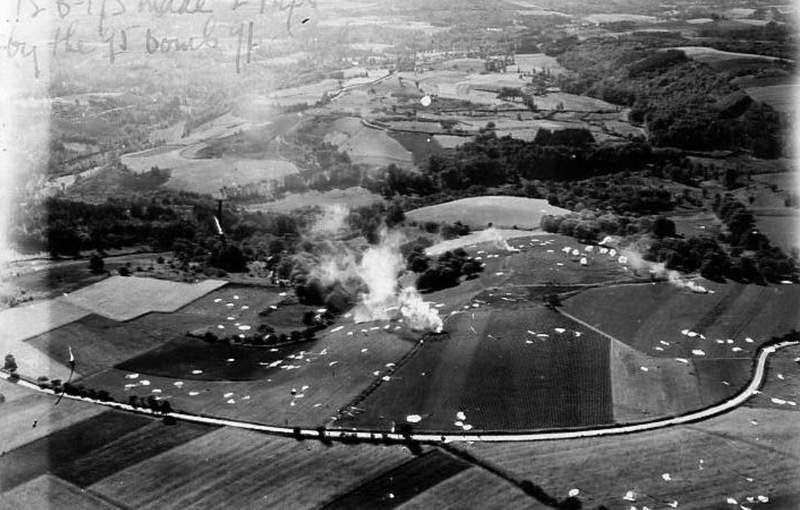 180 B-17s from the 3rd Air Division based in Suffolk and Norfolk, organised in groups of 36 and protected by USAAF Mustangs and Thunderbolts, delivered 2160 containers to the Resistance in four locations in France - Ain, Jura, Haute Vienne and Vercors. The mission was a complete success and a second daytime drop was planned for July this time even larger. On the 8th July the 3rd Air Division 8th USAAF received a request from Général Koenig, head of the FFI, to prepare again for a mass parachute drop, this time code named Operation Cadillac. The drop was destined to the Resistance in 6 locations in 3 regions. The six locations being : Cantal, Corrèze, Ain, Lot, Haute Vienne and Saône-et-Loire. At the earliest, this would take place on the 12th July. A back up alternative dropping point had been arranged in Creuse but had not been needed. 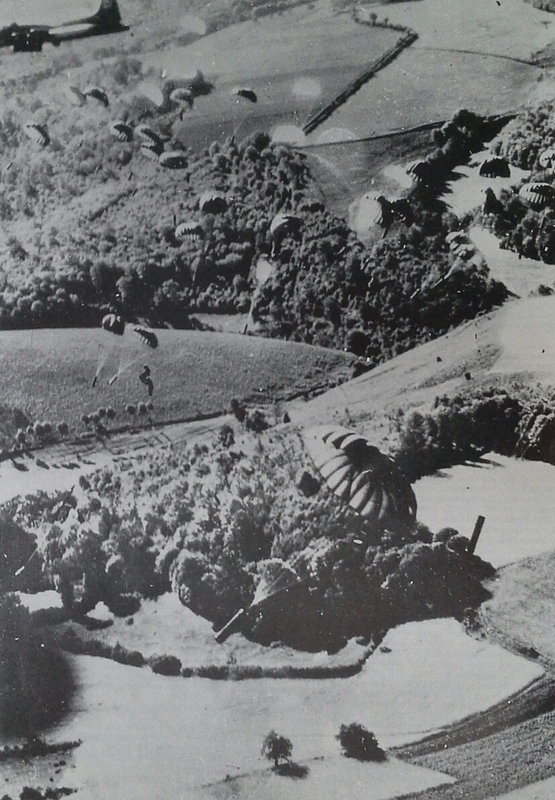 The maquis based in the location in Ain had come under attack by Germans so no parachute drop could go ahead there. No flak within 20 kms of selected dropping points. All information on known German positions within a 70 km circumference around the proposed dropping point must be forwarded to the 3rd Air Division. The terrain had to measure at least 2000 square metres. Dropping points were to be identified by three massive bonfires 200 metres apart forming a triangle. Smoke from these fires should be visible from 8 kms. (Some pilots had reported that they had seen the smoke from 25 kms and in some locations the Maquis had also spread large squares of red sheets near the bonfires as additional identification). A wireless operator equipped with an S-phone UHF radio telephone must be present and permanently on hand and in contact with the 3rd Air Division at each dropping point. Individual messages for each drop zone would be transmitted by the BBC at 1930 hours and 2130 hours to confirm the parachute drop would be going ahead the following day. 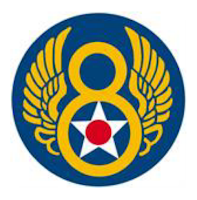 On the 11th July the 8th U.S. Air Force received the go ahead for Operation Cadillac to take place on the 14th July. Nine bases of the 3rd Air Division each prepared 34 to 37 B-17 Flying Fortresses with containers packed with arms and supplies. The War Office provided 125 three ton trucks with loading parties to transport containers for 378 aircraft from eight depots (one being at Holmewood Hall, Holme in Cambridgeshire. Each air base also prepared extra aircraft as "spares" in case of any problems from take off to arrival over the Channel. Ordnance officers from the 3rd Air Division supervised the loading and SFHQ (Special Forces Headquarters) liaison officers checked the loads and helped with the reception, storage and oversaw the security control of containers and parachutes at each air base. On the 12th July a message was sent to all the regional Officers of the C.O.P.A. asking for confirmation of their drop zone code name, that a team of several hundred would be available at each drop and a radio operator would be there to communicate directly with a member of the crew of the 3rd Air Division Bomb Group designated to their drop. At this point in the interest of security, no date, time or size of drop was given. Each Maquis group were given an individual message to be broadcast the evening before the drop. Some of the messages would have a name, the amount of letters in the name would indicate the time at which the bonfires should be lit. The code being that each letter would represent 30 minutes starting from 0500 GMT. In the evening of 13th July, as arranged, the BBC transmitted the individual messages for each drop zone to let them know the parachute drop would be going ahead the following morning. The first message was broadcast at 1930 hours GMT without the coded name. Later at 2115 hours the message was broadcast again this time including the name to let the Maquis groups organising the reception know what time to light the bonfires. At Footman-Lilas the message received was "L'éléphant du jardin des plantes s'appelle Charles" hence the time to light the bonfires would be at 8.30 local. The time difference between England and France at this time was two hours. At Digger Colonel Berger received the first message at 1930 GMT "La brouette rouge et verte appartient à…". The planes arrived at 0900 so we can only presume that the name given in the later message would have had eight letters. At Serrurier the following message was received "Les cannibales bouffent les esquimaux". At Trainer the following message was received "Atorax grossit toujours". At Ditcher the following message was received "Message important pour Tiburce et Jacquot, arriverons demain avec trente-six amis". "Tiburce" was Albert Brown-Bartroli an SOE "F" Section Officer born in Marseilles in 1915 and parachuted into France near Angers on 20th / 21st October 1943. His mother was English and his father Spanish. 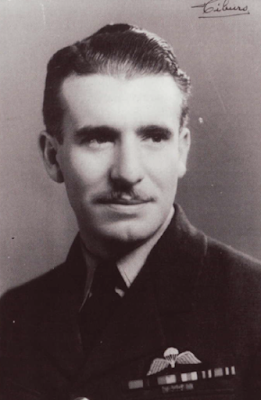 Joseph Litalien "Jacquot" was an American SOE wireless operator parachuted in to the region on 23rd May 1944. Within an hour of the first message all reception groups bar the group located in the Cantal (Serrurier) had responded that they were ready for the operation the following morning. Confirmation was received from Serrurier after midnight. It seemed strange, that morning, for me to look into the bomb bay and not see bombs hanging there. Instead, there were twelve cylindrical containers, each one attached to a parachute. I waved at the guys in the back as we took off and they waved back and smiled, all of us figuring that this was going to be one real nice milk run (an easy and safe mission). What I didn't know at the time was that this was going to be one of the most interesting and enduring experiences of my life. At 3.30am three squadrons of B-17 Flying Fortresses at each of the nine bases prepared for take off. One by one with a 30 to 60 second interval the B-17s took to the sky all following a strict formation. The high squadrons took off first, followed by the lead and then the low squadrons, roughly 12 in each squadron. The weather that side of the Channel was not good and the planes had to climb through several thousand feet of cloud. 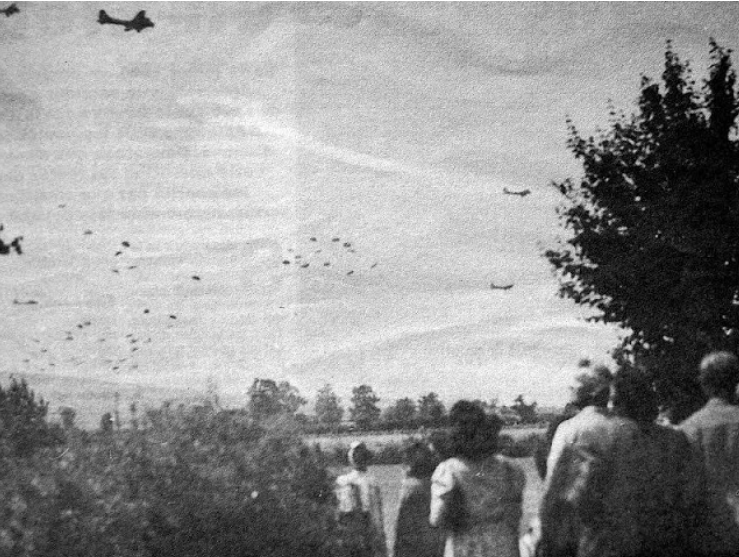 The 349 B-17s taking part in the operation got into formation and proceeded westwards towards Reading. They then headed to the appointed "coast out" over Selsy Bill just south of Chichester in West Sussex climbing to an altitude of 15,000 feet. With all aircraft safely en route the 29 "spare" B-17s returned to their respective bases. The 320 remaining B-17s crossed the Channel and into France in between Caen and Le Havre. At the same time that the B-17s were getting into formation 524 USAAF Fighter Planes (328 P51s and 196 P47s) were taking off from their bases in the South East of England. The 20th Fighter Group based at Kings Cliffe in Northamptonshire, the 357th Fighter Group aka the Yoxford Boys based at Leiston in Suffolk and the 55th Fighter Group based at Wormingford in Essex were some of the Fighter Groups that took part. They joined the B-17s over the north of France. Their role would be to protect the B-17s against enemy attack and if needed to guard over the reception groups at the dropping points in France. Meanwhile as dawn broke over France on what would be a beautiful sunny day, hundreds of French patriots, at each location, were preparing trucks, horses, carts and any means of transport they could lay their hands on to help transport the containers away from the dropping point later that morning. 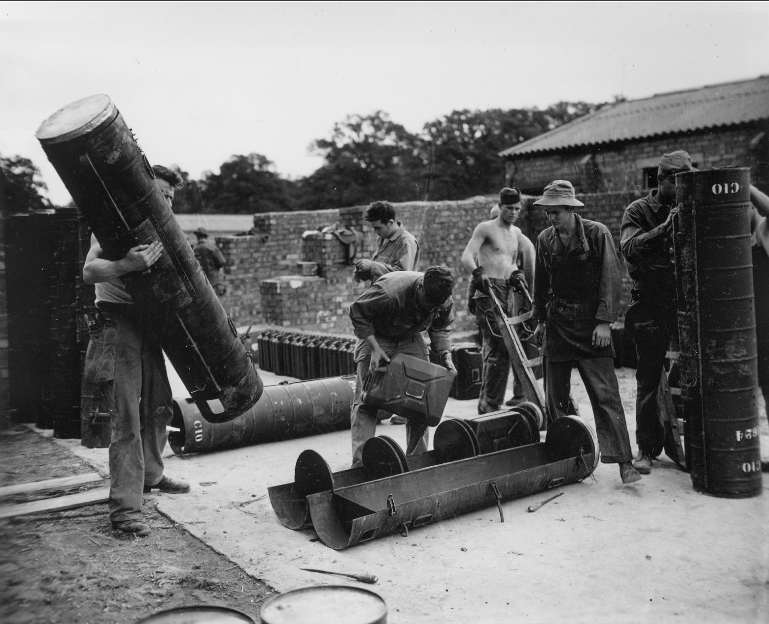 Security posts and manpower was being organised, in some locations trees were cut and left to bar roads that the Germans might use. Each container weighed in at more than 150 kg and would take at least four men to lift each one. 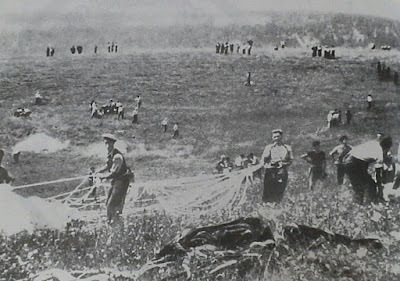 It is reported that more than 500 men took part at "Footman-Lilas" where more than 60 tonnes of arms were dropped. At Digger all was in place for the expected parachute drops at 9am but at 7am the noise of a plane could be heard, insignificant at first but getting louder. False alarm, it was a German plane, a "Mouchard" making its daily surveillance over the area. It could see nothing as all had been camouflaged. From 8.30am the bonfires started to be lit to guide the American pilots in. A mixture of petrol and oil was used to light the fires and green wood put on top to make sure as much smoke as possible would be created. Back in the air the 320 B-17s were heading down to Nogent-le-Rotrou (to the east of Alençon) and on to Blois where the formation then split into two - the 96th BG, 100th BG, 388th BG, 390th BG, 447th BG and 452nd BG heading down to the west of Limoges and the 94th BG, 95th BG, 385th BG and 3 B-17s of the 447th BG heading to Vichy where the 95th then turned east towards their dropping point in the Saône-et-Loire. The remaining BGs continued on to their dropping point on the Vercors plateau. 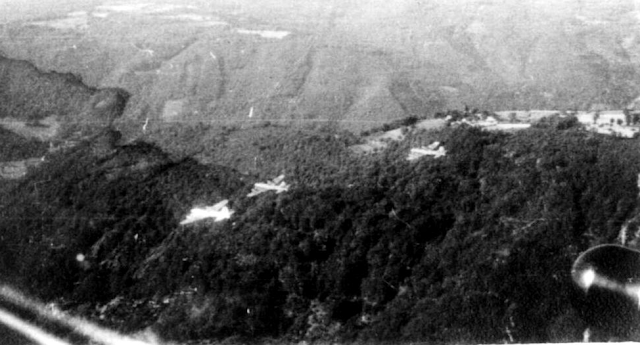 After Limoges 34 B-17s of the 447th BG and 12 B-17s of the 452nd BG continued south flying over the Dordogne, passing on their right, Nontron and Périgueux. As they passed over Belvès they turned east to their dropping point at Footman in the Lot. 37 B-17s of the 96th BG continued south east to their dropping point at Serrurier in the Cantal, 35 B-17s of the 100th BG to Digger in the Corrèze, 388 B-17s of the 388th BG to Trammond in the Cantal near the border of the Corrèze. 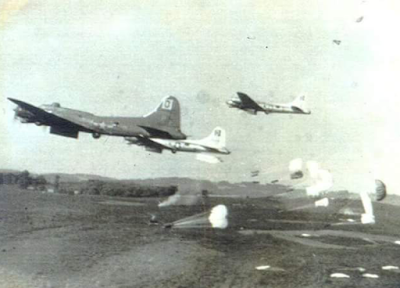 35 B-17s of the 390th BG turn east to Salesman-Stationer in the Haute Vienne. As the planes approached their dropping points each of its three squadrons dropped to an altitude of 500, 1000 and 1500 feet. Richard Goff, aged 19 at the time and the youngest crew member of the B17 "Gold Brick" (100th BG) recalled many years later his experiences as his plane came near its dropping point at Moustoulat in the Corrèze. "At first we thought we were on a bombing mission but we began to ask ourselves why we were flying at such a low altitude. At 500 feet a B17 could be shot down by a machine gun. Then we saw all the resistants on the ground shouting and waving their arms in the air, we could even hear them ! A chill went down my spine. It was great to think that these were our allies and not our enemy. I was just a lad amongst others but I felt indestructible ! I will remember this day for the rest of my life, it was the most fantastic mission I ever made." At Moustoulat (Digger) more than 130 B-17s could be seen approaching in the beautiful blue sky, 60 planes continued on to Serrurier, 36 on to Trammond and 35 B-17s of the 100th BG flew over and then turned round to make their drop at Moustoulat. The lead plane was "Terrible Termite" and the first wave of parachutes were in the colours, red, blue, orange, green, white and black, the second wave were in the French national colours - blue, white and red, a veritable celebration of the 14th July, their national holiday. The third wave again in many colours. The drop lasted for around 15 minutes. 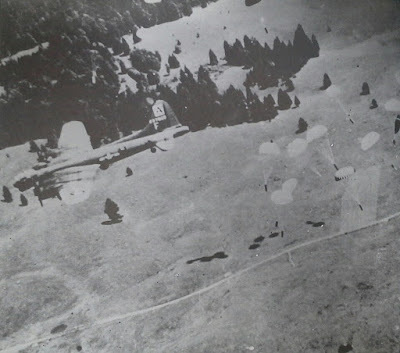 Twelve fighter planes ensured the safety of the drop at Moustoulat and once all the parachutes had been dropped the fighter planes returned over the terrain giving those below a little show performing acrobatics . Clare Harnden, one of the crew of a B-17 making the drop turned to a colleague and said that one day he'd come back here. In 1994, fifty years later, he kept his word and returned with eleven crew members from the 100th BG who had taken part in the drop. They were given a heroes welcome from all the local villages and towns (link). 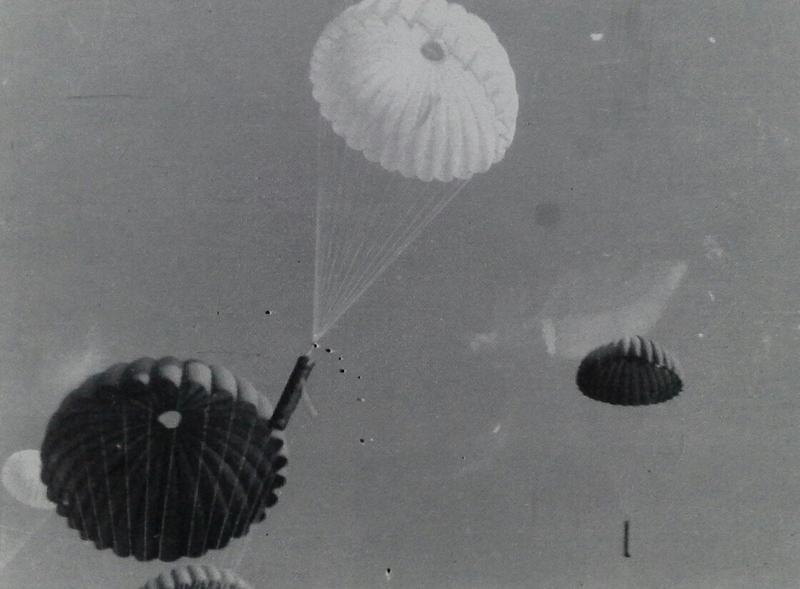 Three days after the parachute drop London received the message from Digger "Daylight operation very successful and took place without a hitch." 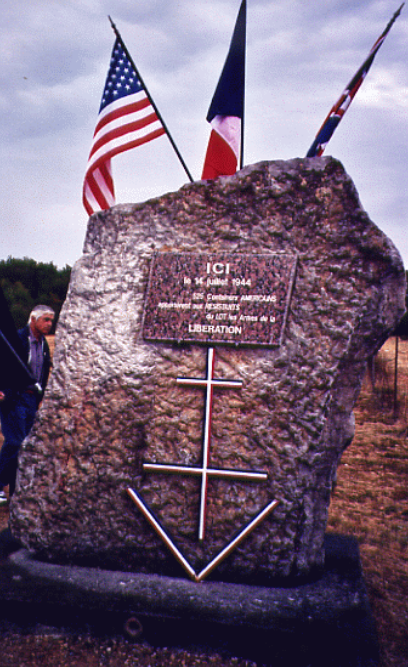 At Trammond a little after 9am many B-17s were seen on the horizon, the men on the ground let out shouts of "Les voila ! Les voila !". Their excitement was short lived as the planes were destined for Serrurier and continued over them. But then immediately following they could see a second formation, 36 B-17s of the 388th BG accompanied by fighter planes. A red light was seen flashing from one of the planes signalling that the men on the ground had been seen. The fighter planes performed acrobatics and were happy to fire their guns to add to the spectacle. Everyone on the ground was ecstatic. As the parachutes fell some of those who had never seen the spectacle before ran and took shelter in the woods, others who had taken part in drops before stood their ground. As the planes left its crew could clearly be seen waving and giving the thumbs up to those below. At Surrurier many of the containers fell just outside of the terrain, some landing in trees and on telephone poles. 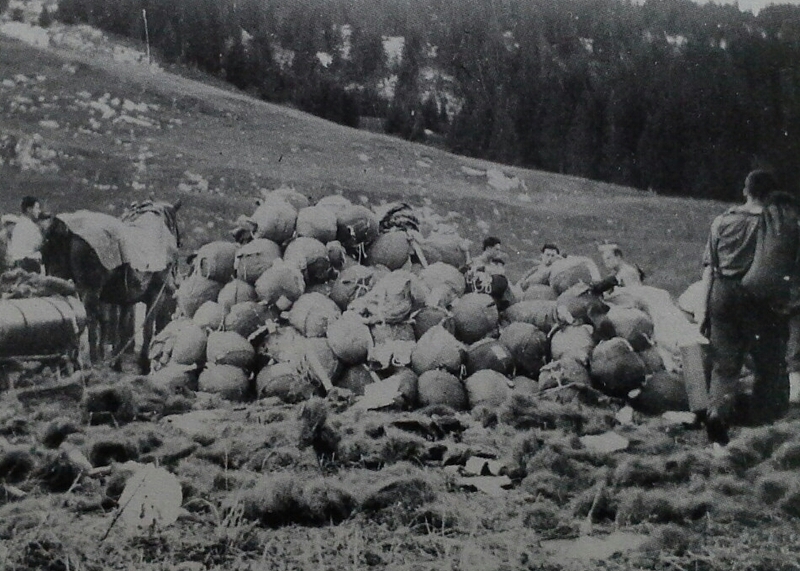 Everyone on the ground set to work immediately to collect all the containers and get them to the D61, a nearby road which crosses the terrain from Pleaux to Enchanet. The containers are loaded onto horse drawn carts that get to the road where they are then loaded on to trucks. At 11am the first consignment is ready and on its way to the Maquis Allard at Néronne. At midday a second consignment, this time for the north of the barrage d'Aigle. And finally at 1pm a third consignment to the same destination to be kept as stock. 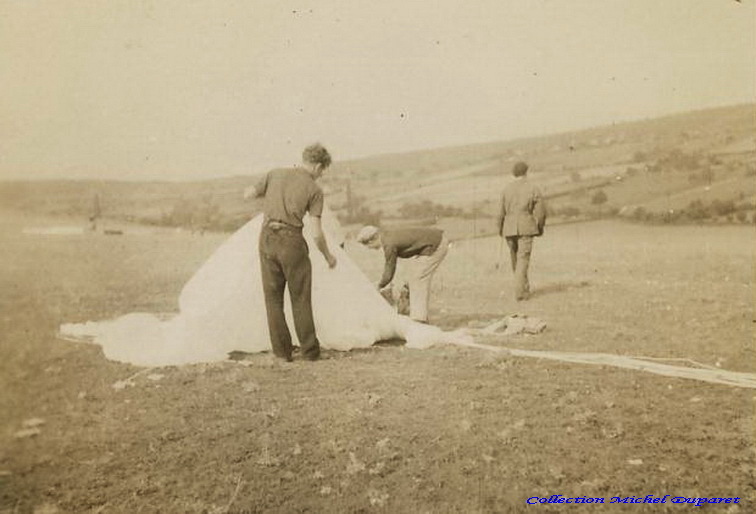 The rest of the afternoon is used to clear the land of parachutes and is carried out by locals and the Maquis Thollon. The next day London receives a message from the organisers at Serrurier "Daytime parachute drop absolute success. Containers received with joy without name". An Officer from SOE, three French Officers and five American Officers also took part in Operation Cadillac, their role was as observers from one of the planes that took part. 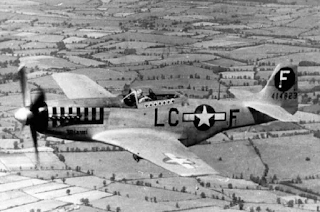 They joined the 4th combat wing of the U.S. Air Force at Bury St. Edmunds in Suffolk (94th BG). 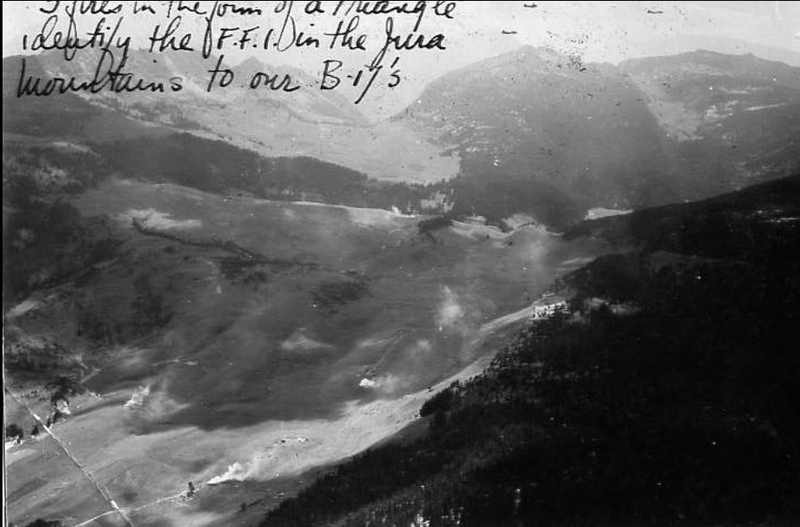 Their drop was at Trainer on the Vercors plateau near Vassieux-en-Vercors and took place from 9.30 to 10.00am The pilot later reported that he had noticed the three large bonfires from 25 miles away. Head of all parachute drops in the Vercors region had been capitaine Robert Bennes "Bob". 72 planes took part and the majority of the containers fell within the target area. 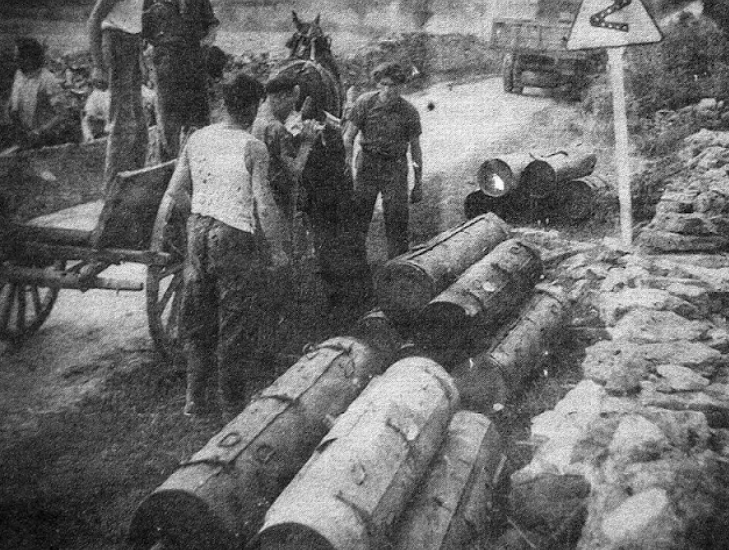 However, it was not possible to collect the containers in daylight as the area immediately came under attack by the Luftwaffe once the B-17s and US fighter planes had left. The Germans also attacked Vassieux from the air and bombing continued until late in the afternoon. The Germans returned a week later destroying the church and 140 of the 150 houses in the village (link). The time taken for all the planes to make their drop at Vercors had been exceeded by 20 minutes and possibly as a consequence to this some of the B-17s had lost the protection of the US fighter planes. As some of the B-17s started to leave the area they were attacked by 10 to 15 enemy fighter planes (FW 190s) some of whom were shot down by the Americans. One of the German fighter planes went down at Chateauneuf-de-Galaure near Saint Donat, the pilot survived and was taken prisoner by the local Resistance. In reprisals the Germans shot five people at Chateauneuf. Several of the US B17s had been hit and one of the 447th BG at the back of the formation was not able to get back to its base in England and landed on a Normandy beach-head, along with another B-17. The 447th BG plane was piloted by Lt. Hyder, all his crew survived the crash landing and the plane was salvaged on August 9th 1944. At Loubressac on the terrain Footman/Lilas a "Mouchard" (an enemy reconnaissance plane) flew over a little before the expected arrival of the B-17s and put everyone on the ground on tenter hooks. Everything and everybody well camouflaged it saw and noticed nothing. Then, a little while after, the sound of engines could be heard and what looked like shimmering stars on the horizon. The B-17s approached and the amazing sight of strength and beauty made everyone on the ground's heart start to pound and those who had not cried for years now surprised themselves as they began to shed a tear. 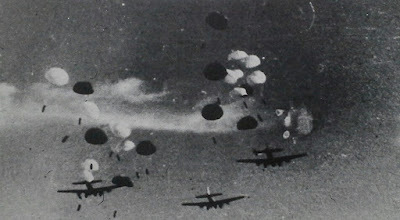 The containers fell, some so heavy that they had two or three parachutes attached. The final wave of parachutes being in the French national colours, blue, white and red. On the ground the groupe Vény under the command of Raymond Picard then set to work on collecting all the containers and transporting them away. Two SOE Officers parachuted into France on 7th January 1944 were instrumental in organising the drop, George Hiller "Maxime" and Cyril Watney "Michel". At Salesman a message was sent on the 14th July to London that the drop had been a success but it was reported that some of the parachutes had not opened. The following day another message was sent stating that they could handle 1300 to 1700 containers in a future drop if possible. At Ditcher the Maquis of the Saône-et-Loire along with numerous local farmers who had turned up with their horses, oxen and carts were ready for a parachute drop expected at 9am. These would be needed to transport the containers to the nearest road where trucks would be waiting. It has been said that it felt as if everyone had turned up to help or watch the awaited spectacle. On the terrain the three massive bonfires had been lit and a massive "A" (the code letter for the operation) had been made out of five large sheets and was laid out on the grass. 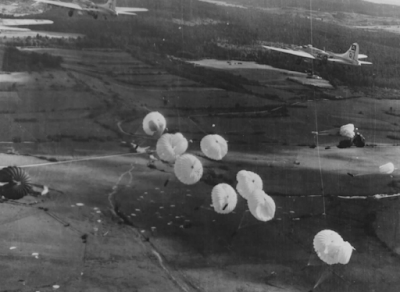 Finally a little before 9am the first squadron of twelve B17s of the 95th BG flew over and released its cargo of twelve parachutes each, in this drop the parachutes were white and green. On the horizon one could then see the next squadron and then another, the final drop were parachutes in blue, white and red. In total 423 containers were dropped weighing in at nearly 50 tonnes. The terrain was a little exposed so it was necessary to work fast to get all the containers to the trucks. The work was carried out by resistants and locals alike all in the spirit of celebration. 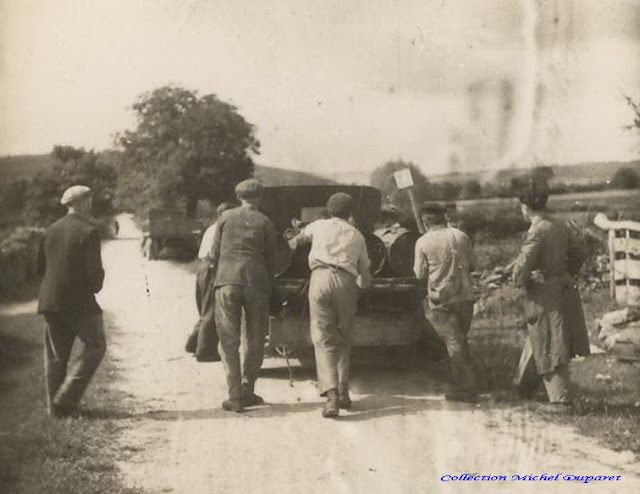 By midday all the containers had been loaded onto the carts and transported to the trucks and by early afternoon the land had returned again to its normal calm. The containers (type "C" and "H") contained explosives, Stens, 9mm Parabellum cartridges, Grammon grenades, Colt pistols, Enfield revolvers, L.M.G. Brens, Lee Enfield rifles, P.I.A.T. (Projection Infantry Anti Tank) and P.I.A.T. bombs. The "C" container had one section and could weigh from 120 to 200 kg when loaded. The "H" container had 5 sections and would have been used for explosives, Stens (dismantled), bullets and material for sabotage. Each section (45cm tall by 35cm in diameter) had a code, EM, BC etc so its contents were known without needing to be opened. 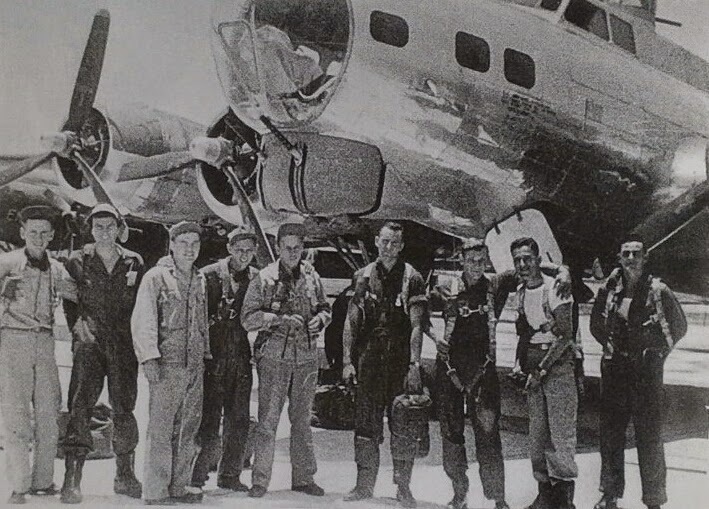 With their mission completed the 320 B-17s began the 500 mile journey back to their bases. Climbing rapidly to 17,000 feet the planes regrouped over Bourges in the Cher and flew in one formation leaving France at Le Havre returning to England over Hastings and then on to their bases in Suffolk and Norfolk, arriving back from 1pm to 2pm. As mentioned earlier two planes who had been hit by enemy fighters had to make a forced landing on a Normandy beach-head with no casualties. Many of the planes had sustained minor damage from enemy flak but were operational again within 36 hours. Pleaux (15) - on the terrain Serrurier, 3kms south of Pleaux on route D61 after the village of l'Herm direction Enchanel. Moustoulat (19) - Monument situated at the junction of the D83E1 towards St. Hilaire Taurieux / Moustoulat and the D83. Loubressac (46) - at La Maresque, route de Bretenoux at Thégra. The monument was inaugurated 21st July 1946. Each year a ceremony is held at the monument (link). There is also a plaque on the wall of the Mairie in the town which commemorates the groupe Vény and the Allies who organised the parachute drop. Operation Buick on the 1st August 1944. Drops were made to the Maquis in the Jura mountains, Savoie, Haute Savoie and Saône-et-Loire. All BGs involved in Cadillac took part with the exception of the 100th BG. 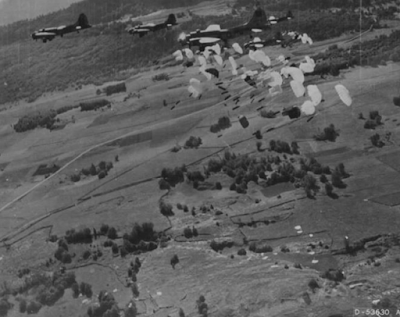 192 B-17s dropped 2,281 containers to the terrains Ditcher (4.5 kms E. Salornay), Marksman/Echallon (6.25 km E. Oyonnax), Ebonite (18km NE. Albertville) and Hippopotame (18 km E. Annecy). As well as the containers seven US Marines (OSS) were dropped at Ebonite. One of the parachutes failed to open causing the death of Sergeant Charles Perry. 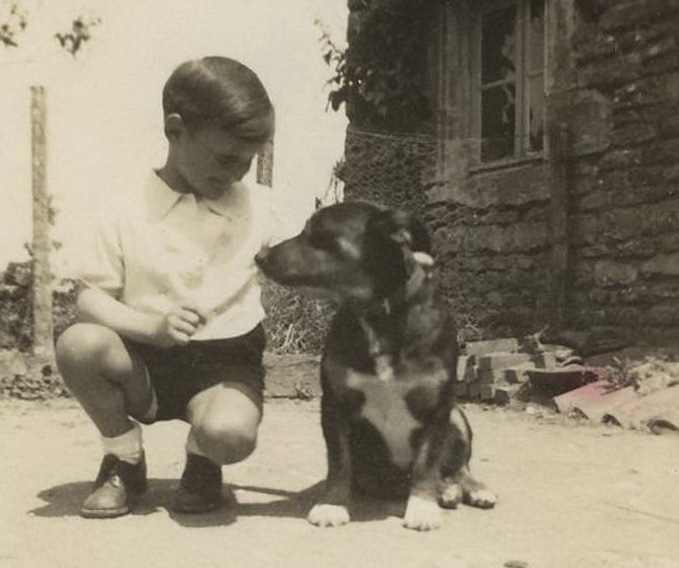 He was buried in France with full military honours. Operation Grassy on the 9th September 1944. 68 B17s from the 94th BG based at Bury St. Edmunds and 447th BG based at Rattlesden, Suffolk dropped 180 containers to the Maquis 25 miles south of Besançon. 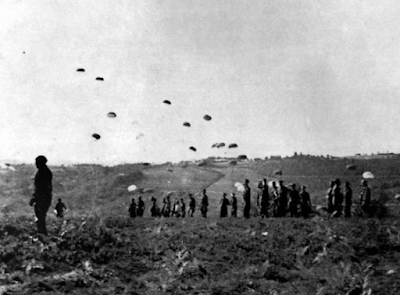 Within eight weeks after the parachute drop of 14th July 1944 every region involved had been liberated. The Germans surrendered at Brive-la-Gaillarde nearby to Moustoulat on Aug 15th with the German Commander saying that it was partly because they believed Allied Commandos had parachuted in on 14th July. 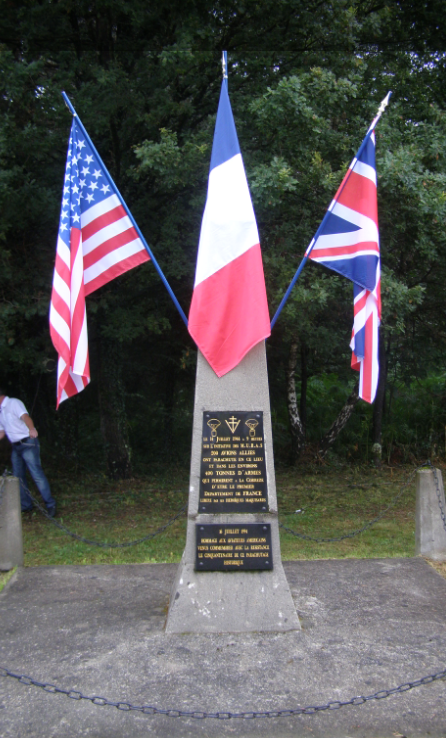 The department of the Lot was liberated the 17th August 1944, the 22nd August 1944 the Corrèze was liberated. The village of Vassieux paid a heavy price for its involvement with the resistance and its location to the parachute drop, but on the 2nd September its region was liberated. The department of Saône-et-Loire was liberated the 10th September 1944. I have two more articles on Cadillac in the pipeline, one of all the witness accounts / temoignages that I can find (link), a second on the Containers themselves. If anyone has any additional information, photos or documents concerning Cadillac I would be very happy to add to the article.